4000 Students Plant 800 Trees in 22 Hagonoy Public Schools to Tackle Climate Change: “One Child, One Tree” at a Time | FEED, Inc.
13 January 2017, Hagonoy, Bulacan. The “One Child, One Tree” initiative was launched on January 13th to reconnect as many Public Elementary School students to the benefits of tree planting and environmental stewardship, also designed to encourage a larger community effort to help green Hagonoy’s tree canopy, source and knowledge of climate change mitigation/adaptation to nutrition, and to help protect the Municipality from the perennial damage caused by persistently intense floods. Bulacan’s coastal perimeter stretches 25 kilometres (15 miles), with everything in between the first coastal barangay (Tag., village) in Salambao, Obando and the last in Pugad, Hagonoy being severely affected by floods*. 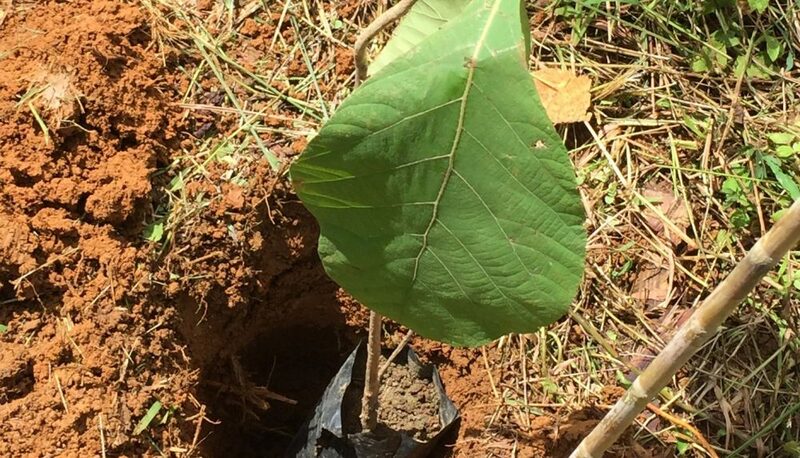 Through agro-forestry and by integrating trees into agricultural systems, rural communities are better adapted to climate change, can mitigate its impact and improve their source of livelihoods as climate-smart agriculture typically offers triple wins for food security, climate adaptation and mitigation. Previous tree plantings in Hagonoy did not fare well due to the wrong trees being planted, insufficient soil assessments, extensive winds and rain, and persistent salt water intrusion and flooding from the nearby fishponds – a major source of livelihood for the area. The first seeds of the One Child, One Tree initiative were sown by Natalia Sali, a Philippine visiting Hagonoy resident with family roots in Bulacan. Though she herself is based in London, she was able to mobilise the resources (i.e. people, plants and partners) to reach 4000 students who planted 800^ trees in 22 Public Elementary Schools throughout Hagonoy on January 13th. Thanks to Natalia’s staunch leadership, the project mobilized different agencies to contribute to the attainment of the goals. The participating agencies worked in partnership to complement each other’s resources including practical help in training and planting, their time, technical expertise, and even 3 linked the coordinator to different experts. “a child, once made aware about his/her role in looking after the environment, will become an advocate and will continue to do his/her part as he/she grows old. A child who plants his/her own tree will then own the responsibility of nurturing this tree”. The project targets learners in Years 1 and 2 with a view that he/she will nurture the tree as he/she continues his elementary education. The main objective is teaching the child to be a responsible member of the community. To raise the profile of schools as environment-friendly institutions. Education – Facilitation of an hour’s lecture about the environment, the value of trees to people and the environment, and types of soils. This was delivered by trained volunteers. Tree planting – Each Grade 1 and 2 learners was allocated a tree to plant, or for those schools without enough space, to plant as a group. They named their own trees and will nurture and take care of them as they continue their elementary education. The tree planting was simultaneously held in all participating schools. Volunteers have taken pictures and videos and shared in social media to create awareness amongst the wider population. Promotion and awareness raising – a Facebook page has been created to share the schools’ and children’s experiences as they take care of their own trees. They can post their pictures of themselves and their trees. This will encourage and inspire more people to plant trees themselves. The various school heads of the 22 Public Elementary Schools in Hagonoy expressed their sincere gratitude for the ONE CHILD, ONE TREE Initiative, saying they will continue the advocacy annually. “I am so further inspired, touched, and moved by today’s experience and your (ref: Natalia Sali) leadership. I wish we could continue this initiative as it inspires everyone to plant and, most importantly, the kids who will hopefully be transformed”. Anne-Marie M. Bakker, FEED, Inc. The One Child, One Tree effort inspired participating schools to continue looking after the environment and to work in partnership with different public, private and NGO groups. The partnership will lead to long-term environmental projects in the coming months to ensure its institutionalisation through various means. The project also identified issues that can be tackled on a long-term basis such as frequent flooding in 50% of the schools and the lack of source of mangroves propagules, nurseries and protectors. Led by Natalia Sali, a new project is now being formulated and planned between FEED, Eco Rangers and the community of Tibaguin – the most disaster struck town. It will ultimately be aimed at reforestation of mangrove forests in Hagonoy, up to critical areas being declared as protected areas by Philippine legislative and enforcement agencies. Mangrove forests are primarily seen as a critical spawning and breeding ground for various terrestrial and aquatic species. ey function as shoreline protection and erosion control, and also provide sources of food and livelihood. Tibaguin mangrove forest in dire straits. One Child, One Tree advocates and partners will continue seeking sustainable solutions, starting with the most critical needs, i.e. mangrove and other coastal species protection against flooding and saline intrusion, whilst ensuring the strengthening of existing as well as alternative livelihood sources (i.e. fruit, vegetable bearing crops, and sustainable fisheries) to optimise water and food security for the residents of Hagonoy. FEED encourages this type of tree planting program that directly engages children, also delivers a hands on learning opportunity to get youth involved in the environment and conservation of our natural resources. Recent scientific studies even suggest that students are better able to concentrate, finish tasks and follow directions after being in natural settings. Through experiential learning, they are able to see, touch and feel the structure of the trees, learn how to care for them and watch them grow. Teachers used the planting process to share the various benefits trees provide and it is an intimate and profound way of establishing Living Legacies early on in life. Dino Balabo – February 1, 2011. “HAGONOY, Bulacan , Philippines – Climate change has taken its toll on two coastal villages of this town along the Manila Bay hampering livelihood and food production while threatening to wash away the villages into the sea. This is due to the destruction of at least 100 hectares of municipal fishpond or propius fronting the Manila Bay. The said fishponds served as a buffer for the villages of Pugad and Tibaguin here for decades, but declined in management, left it to the waves during rainy season that wiped out the rock and soil dike making it not part of the sea. “Time and weather has changed this place,” rued Alfredo Lunes in the vernacular, while piloting his motorboat toward a dead tree that remains standing on the submerged dike of the damaged municipal fishpond. A village councilman of Pugad, the 42-year-old Lunes who is fondly called “Doy” by his friends told The STAR, aside from the lone dead tree beside another which was felled by the waves, nothing is left of the fishpond dike aside from the remains of concrete check gates that stick out of the water during low tide. The check gates which used to control inflow and outflow of water is of no use now except for being home for growing oysters and mussels. Doy said that the dikes of the municipal fishponds served as buffer of their village from strong waves during typhoon season. But the dike began to deteriorate nine years ago as one of the last propietario of the municipal fishpond cut mangroves and other coastal trees that grew on the dike for decades. It was followed by the absence of a new propietario, as no one dared to rent the propius from the municipal government. With the fishpond dike gone, Barangays Pugad and Tibaguin were left to the mercy of the waves that penetrated even the center of the villages, especially during high tide. “The waves are so powerful, some houses fronting the Manila Bay were literally uprooted,” Doy said. This situation, he said, forced many residents to move to their relatives in mainland Hagonoy during typhoon season. But threats to human lives and properties are not the only impacts of climate change in coastal communities. Ramon Atienza Jr., the chief of Barangay Pugad noted that even their livelihood is at stake. “The sea appeared to be running out of fish,” he said in Tagalog. In the past, Atienza said residents of coastal villages of Bulacan including Pugad and Tibaguin were living in relative affluence due to daily generous catch from the sea. “They said it’s a combination of over fishing, pollution, climate change, but we think that its more of the latter,” he said. Acknowledgements: Our sincere gratitude to all those who contributed to the success of “One Child, One Tree”! This writing is a joint piece co-authored by and with direct quotes from Natalia Sali, Founder/Initiator of the ONE CHILD, ONE TREE Partnership, with extracts from the “One Child, One Tree Project Implementation Report” dated 22 January 2017. Click here for the full One-Child-One-Tree-Implementation-Report.